When you hear the name "Toontrack" the first things that come to mind are probably EZ Drummer, and the higher version—Superior Drummer, which are very high-quality, high-functionality, easy to use drum sound modules. 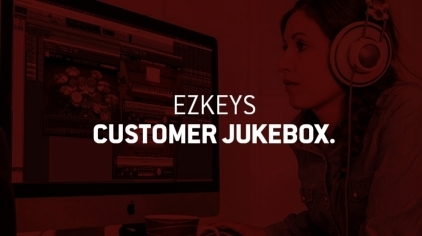 Actually, EZKeys is the first product made by this company that is not related to drums. 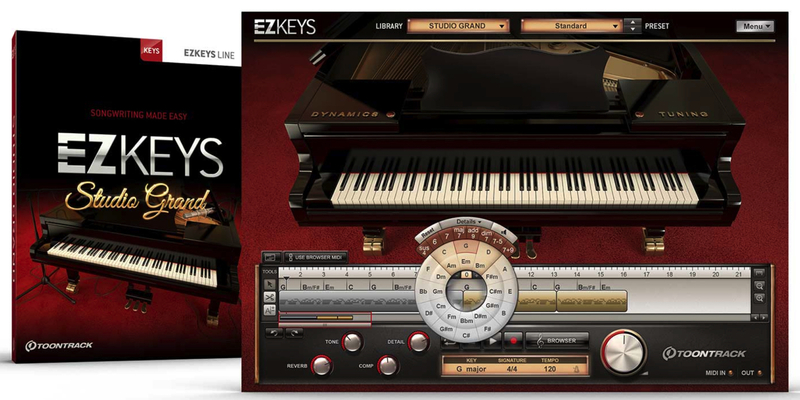 The biggest feature of EZKeys is that not only does it work as a very easy to use piano sound module, but it also includes a player and an editor that lets you put together very realistic patterns and MIDI phrases. 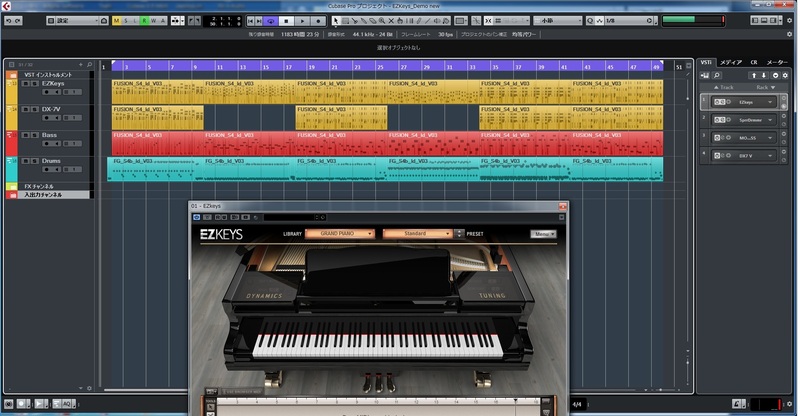 EZKeys was actually released around 2012, so it's already six years old, BUT they are still releasing expansions and MIDI phrases and other content, so it's grown into quite a large package. These three come bundled in the EZKeys Essential - BUNDLE. 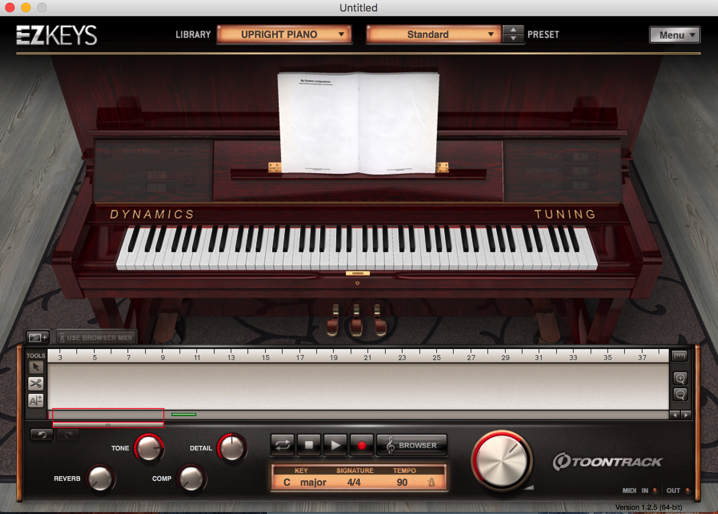 Almost all software piano instruments nowadays utilize physical modeling or PCM sampling to generate sound. Recently, with the ever-increasing storage capacity and read speeds on SSD drives, along with their decreasing prices, it's a given that such software instruments are going to be high-quality, giga-sampled sound generators that require a huge amount of storage space. EZKeys is a sampling-based generator, but compared to other similar products, requires much less storage space. In addition, switching between preset sounds is a very quick and smooth process, comparatively. It goes without saying, trying to compare it to a giga-sampled ginormous space-taker-upper of a sound module is nonsense, but even so, they've put the sampling techniques they developed while making EZ DRUMMER to work, with the result being a compact, great-sounding, easy to use product, which utilizes optimized waveforms and fine-tunings. Demo sounds serve to introduce a number of the representative sounds of a handful of different pianos. Phrases are organized into 3 patterns for each module, so that it's easy to hear the differences or unique qualities between them. 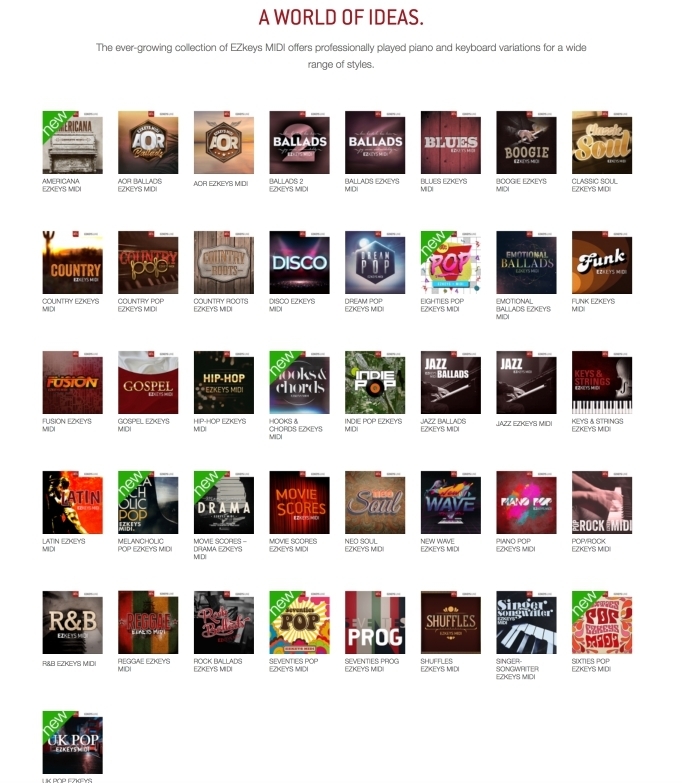 Furthermore, you can check out more variations of the sounds on Toontrack's homepage. We put together some EZKeys MIDI phrases to give you a basic intro to the representative preset sounds of various pianos and electric pianos in the collection. While none of the pianos really stands out strangely, or says "THIS IS AN EZKEYS PINAO!" none of them have any real downsides to their sound either. They're very orthodox, and would be right at home in an orchestra. When considering the cost, storage space, and speediness & ease of use, the package stands out as easy to use, and great-sounding. Next we'll look at a demo song put together using the MIDI phrases, and we think it sounds particularly nice. Each piano (sound library) comes with a number of presets, with effects and controls and parameters optimized for each one. 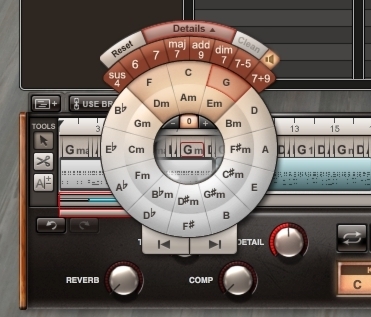 This is a feature carried over from the EZ DRUMMER, which uses MIDI phrases—accessible through the phrase library—which you can put together and arrange how you like, for very realistic performances and patterns. While scrolling through the previews, you can select ones you like and put them together to make an original song. This is a fairly revolutionary feature as far as pattern writing and arranging are concerned. 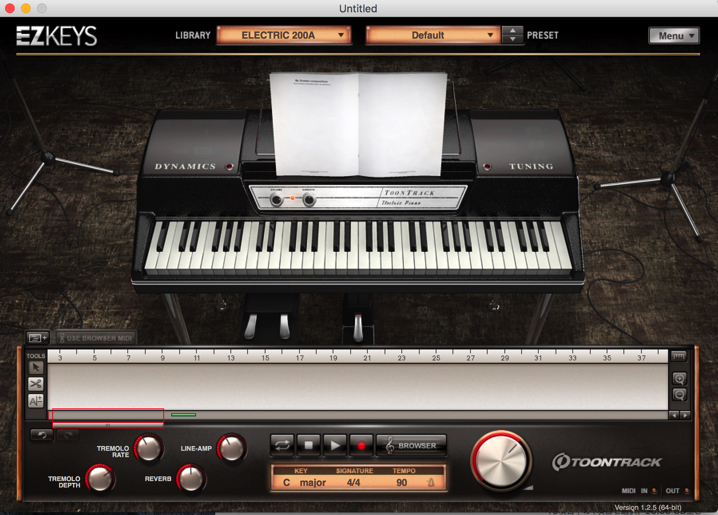 EZKeys also includes a song browser, another feature from the EZ DRUMMER. You can select phrases you like and put them together however you like, and make songs. These phrases include phrases played by famous musicians, and cover a number of genres. By putting phrases together, it's super easy and quick to write a song, and at the least the phrases can work like helpers or a sort of assistant, and are and easy source of inspiration for writing songs. Based on music theory, chords and progressions follow a logical methodology, which attempts to match and change the accompaniment so that the most suitable chords are used with whatever you play. 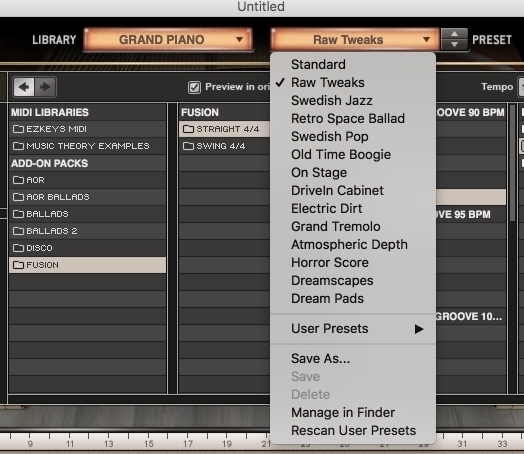 With this feature, it's quite simple to come up with original piano performances in which you have automatically generated backing tracks. For people who aren't experts with music theory, or those just taking their first steps into the world of keyboards, or even people who can't play a keyboard or piano at all, using the song browser and/or the MIDI phrases, it's VERY easy to come up with quite high-quality finished songs and arrangements. These are VERY useful features! And, they're easy to use. First, you select the genre you're into. Then, you decide the timing and tempo, select the intro and bridge parts, and basically put together a song almost like assembling pieces of a puzzle, just using phrases you like after auditioning them. The MIDI phrases you select can be drag and dropped into the song tracks (explained below), so changes are immediately put into effect. In the same way, yo can put together a song just by arranging the different sections/parts, and in the end have a finished piece of music. This is truly an easy to use tool for writing songs. We've talked about the Song Browser section above. If you find a MIDI phrase you'd like to use, by drag and dropping it into the Song Track, you have the freedom to edit things to your heart's content. You can use the Chord Selector to set how the chord progressions will go, and you can add major, minor, 6th, 7th, and even 9th chords! This means you can easily and automatically put together an original progression that doesn't fall apart in the middle or have sections where the preceding or following chords are fighting with each other. The Chord Selector at its heart is based on fundamental music theory, and has the circle of fifths prominently displayed and emphasized. It's very easy to choose chords which follow theory and make musical sense, BUT you have the freedom to choose whatever chords you want to use! Most people use DAW software to compose/arrange songs, at least we think so. 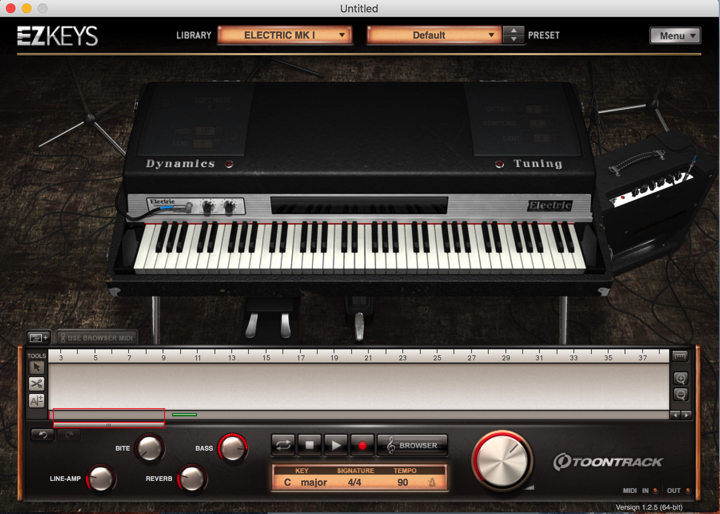 EZKeys is completely functional as a standalone unit, but it can also be put to use as a plug-in in whatever DAW you happen to be using. One way of using it would be to simply call up a piano sound from EZKEYS that you want to use. Essentially this would have the EZKEYS functioning as a piano module. Another way of using it is to build tracks using MIDI phrases from the EZKeys Song Browser. It's as easy as drag and dropping the track contents from EZKEYS right into the track on your DAW. And of course, you can directly select phrases from within the browser of your DAW, and drag and dropping them onto tracks. On the DAW side of things, it's almost the same as if you'd gone through the trouble of either entering all the note/pattern/part data manually, but the difference here is that you can get a whole track done in the blink of an eye. Moreover, you have the ability to edit each individual note and all such data from within the DAW, so by changing just a few things around you can easily come up with totally original compositions. Using with EZ DRUMMER etc. For those of you who already own Toontrack's drum packages (EZ DRUMMER and SUPERIOR DRUMMER), you can put together original drum tracks much in the same way as mentioned above, so it's VERY easy to compose drum patterns and backing tracks that work well with your piano tracks. For composers who place importance on realism, this allows a reduction in the programming time usually required for making realistic sounding tracks in the box. Without being distracted by a million excessive things or fretting over details, you can really get high quality results VERY easily, in our opinion. 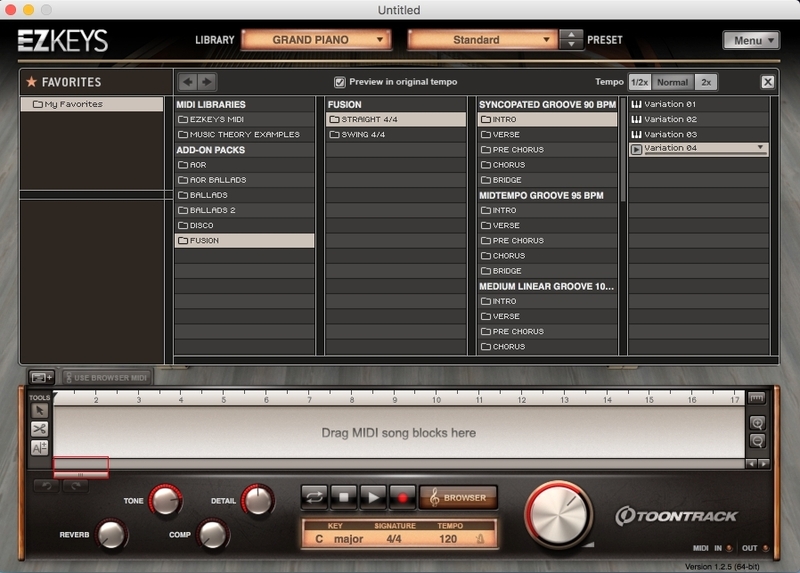 Toontrack offers expansion packs for EZ DRUMMER and SUPERIOR DRUMMER, which cover a wide variety of genres and include a vast array of sounds, MIDI phrases and other contents. EZKeys is no different. 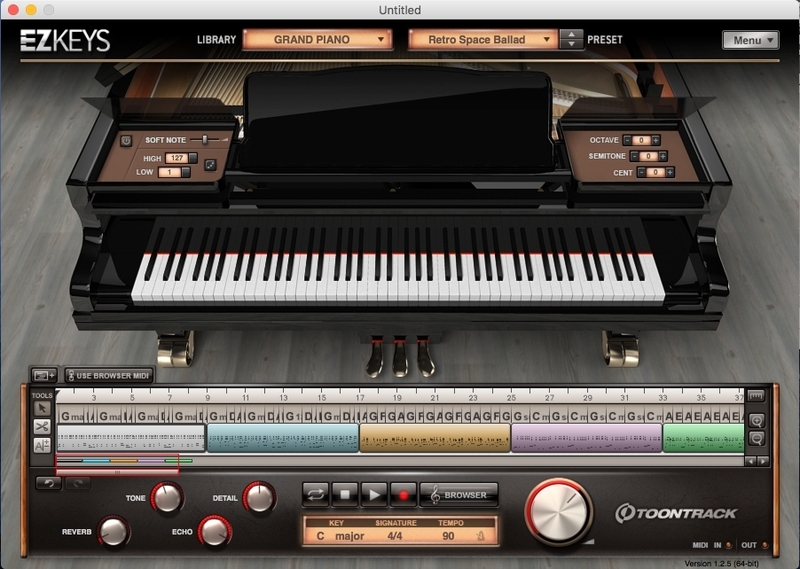 A variety of different pianos, organs, even the Mellotron are available as sound expansions, as are MIDI phrases which (as above) cover a variety of genres and styles. The most convenient thing though, is that they've prepared genres and styles that are the same across product platforms. For example, take the genre/style of Fusion. 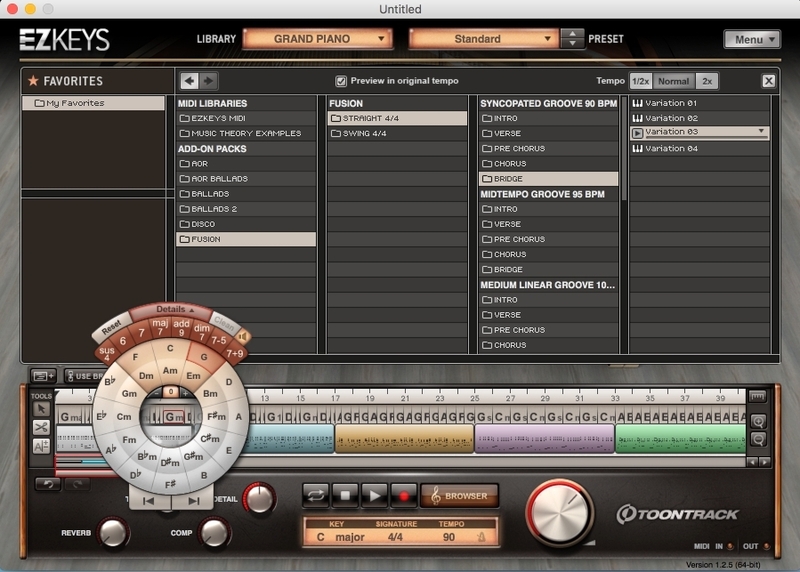 MIDI phrase libraries are available that cover this with both the drum and piano expansions. By purchasing the above add-on content, it is really easy to combine phrases from a number of different libraries into a sort of fusion production/arrangement. And there are phrases which we're sure most of you will feel like "you know, I've heard this somewhere before," which you can slap into the chord selector, rearrange as you like, and by just a bit of tweaking on the DAW side of things, you'll end up with an end result that is really high quality. This is where EZKeys users show off songs they've made using the MIDI phrases. Just by listening it's hard to tell whether the phrases were used as-is or edited a bit or totally worked over, but all of them are well-done and worth a listen. 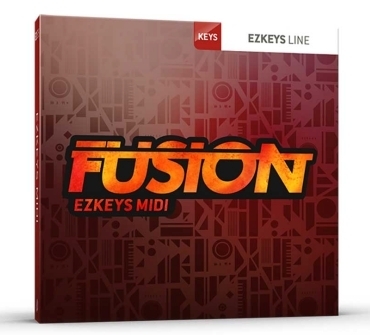 As mentioned above, there is a Fusion Pack available for both EZKeys and the Drums packs.We used some of the phrases and came up with our own original songs. All from the Fusion Pack. The bass (left-handed part) utilizes a bass engine so we did away with that. In the mix, we added a reverb insert effect, but nothing else. 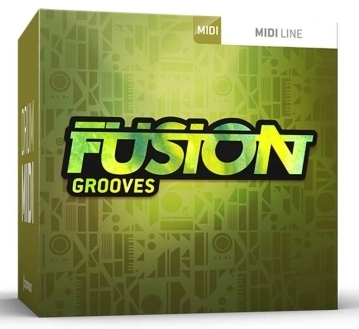 FUSION GROOVES MIDI phrases used to build the song. We copied the piano part, then erased all but the left-hand data. We also edited some notes so they stayed within the key we used. We copied the piano track data as-is, and edited a few bits here and there, and used Unison Mode at certain points. This demo song was made just by simply arranging and fiddling with MIDI phrases, as detailed above. The left-hand part of the piano track was erased, with the data used in a bass track. In the same way, the right-hand data of the piano track was copied and used on a track with the DX7 V. Each part was tweaked just a bit to make sure everything fit together in the same key, or that note lengths didn't fight with each other. Being able to do editing like this means that it is truly easy to put together full-on tracks with little fuss. 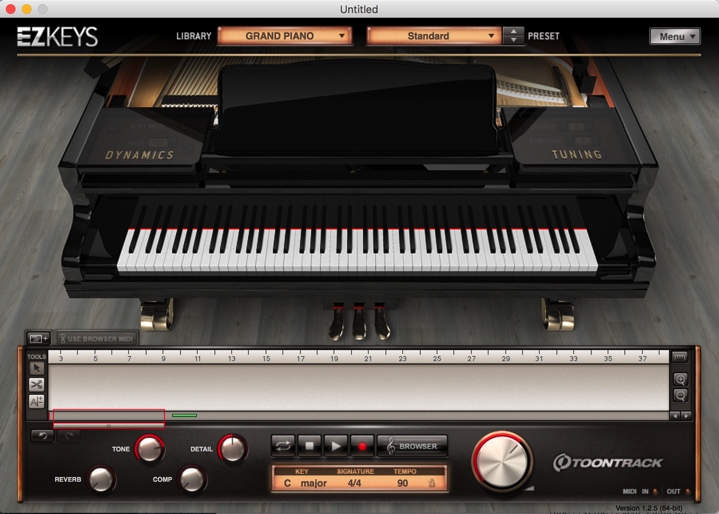 It is easy to use just as a piano sound engine, but because it's also quite well-done as a production tool, we really think this is a great piece of software. It's reasonably priced, and you can purchase just the piano pack, adding on the MIDI phrases later if you decide you're interested or you need them. As a way to get inspiration for coming up with original songs, or variations on whatever you're working on, we really think this product has value as a composition tool. To see (and hear) all the details, be sure to check the video.